On Wednesday over 500 members of the data science community gathered at the Village in San Francisco for CrowdFlower’s Rich Data Summit. It was great to see familiar faces, meet new people, and hear data scientists share perspectives. Despite a wide array of vantage points, the talks coalesced around some exciting ideas for the future of data science. 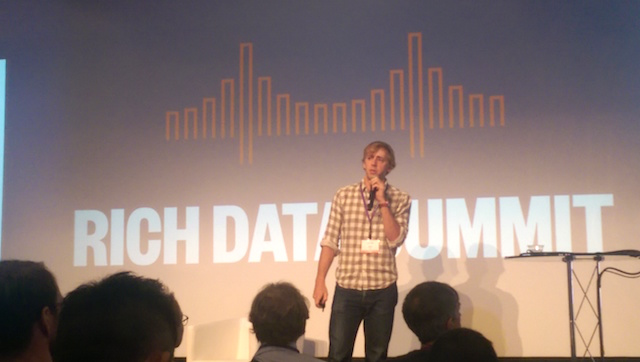 Throughout the day, speakers confirmed that we’re still grappling with the definition of data science. In the “The State of Data Science” panel, Bruce Smith (Intuit), Daniela Braga (VoiceBox), and Tim Converse (eBay) discussed how they’d been doing data science years before the term itself emerged. The effective balance of algorithms and human experience was a common theme. From suggesting an Uber rider's destination to helping companies automate replies to support inquiries, machine learning is becoming more and more sophisticated. Will it eventually render us obsolete and out of jobs? Many of the speakers seemed to think not. Lukas Biewald from CrowdFlower pointed out that we’re introducing new technology in pieces. Instead of introducing a car that’s completely self-driven, Tesla recently launched Autopilot to make driving in traffic safer. But drivers still keep their hands on the wheel. 3. Don’t just do well. Do something good. Catherine Bracy (Code for America), Beth Noveck (The GovLab), and Wendy Kan (Kaggle) all shared examples of how data scientists are using quantitative skills to solve social problems. Perhaps the most passionate talk came from Eric Schles, who uses Python to stop human trafficking by scraping and analyzing text from sites frequented by perpetrators. Crowdsourcing is the foundation of many of these organizations. The GovLab is crowdsourcing experts in evacuation planning and redevelopment to help city officials in Quito, Ecuador prepare for the likely eruption of a nearby volcano. Schles’s Hacking Against Slavery project depends on the contributions of many to eventually build software to combat slavery. Join Eric Schles in his mission to catch human traffickers. Check out the Hacking Against Slavery site for ways to help out. Get involved with Code for America by joining a brigade to solve local civic issues or choosing a project to contribute to on GitHub. Attend one of NYU’s GovLab sessions to find out how you can help Quito officials prepare for the Cotopaxi eruption. Participate in a Kaggle competition that promotes social good, such as this project to identify endangered whales in aerial photographs. So how do we better communicate our work? Stancil suggests data scientists hone their communication skills by following in the example of skilled data journalists at FiveThirtyEight and The New York Times.